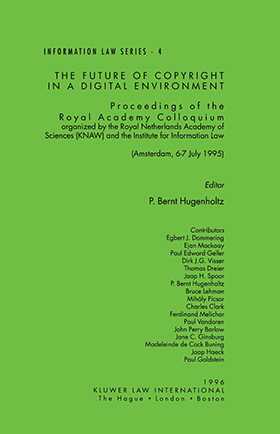 This book contains a unique collection of papers, written by the world's foremost copyright scholars and practitioners, presented at the colloquium on The Future of Copyright in a Digital Environment in Amsterdam on July, 1995. This colloquium was organized by the Royal Netherlands Academy of Sciences (KNAW) and the Institute for Information Law at the University of Amsterdam. This collection of papers is the first to cover the complete range of problems involved, including the scope of protected rights on the information superhighway, the application of exemptions and limitations, the collective administration of rights, resolving conflicts of law in an environment where territoriality is obsolete, alternatives to copyright protection and designing copyright for the future.